Gleneagles will not run in the Irish Champion Stakes at Leopardstown due to the conditions being deemed unsuitable. 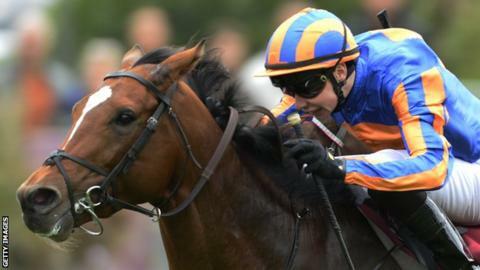 Trainer Aidan O'Brien decided not to risk his dual 2000 Guineas winner on rain-softened ground, despite efforts by the course executive to run the race on the best possible going. It removes the prospects of a highly anticipated duel between Gleneagles and Derby and Eclipse winner Golden Horn. "The going is just a bit on the wrong side for him," said O'Brien. "It looked all along that we were going to get there, but I couldn't believe it when Nessa (Joyce, operations manager) said they got 27 millimetres. "He was ready today, as ready as he possibly could be." Trainer John Gosden will walk the course before deciding whether Golden Horn, to be ridden by Frankie Dettori, will race. The decision to run the Irish Champion Stakes an hour earlier than originally scheduled in an attempt to ensure the main event is run on the best possible ground meant Dettori was forced to miss a plum St Leger ride on O'Brien's Bondi Beach. With Golden Horn having already missed the King George VI And Queen Elizabeth Stakes at Ascot this summer on account of unsuitable ground, Gosden is keen to let him run. "If it's good or good to soft ground we'll run. If it goes very, very soft, I'll walk that track about three times until my wellies fill up and then make a decision," he said. Golden Horn suffered a shock defeat at the hands of Arabian Queen in last month's Juddmonte International at York. Gleneagles added the St James's Palace Stakes at Royal Ascot to his back-to-back Guineas triumphs but soft ground led to his withdrawal from a planned Juddmonte International duel with Golden Horn. O'Brien also has Highland Reel and highly rated filly Found in the entries for the Irish Champion Stakes. Last year's winner The Grey Gatsby returns after beating Australia 12 months ago, while Dermot Weld's four-year-old Free Eagle is in the field after winning the Prince of Wales's Stakes at Royal Ascot in June. Seven-time Group One winner Cirrus Des Aigles may not be unduly affected by the soft ground, while Jim Bolger's Irish 1,000 Guineas and Yorkshire Oaks heroine Pleascach is also in a stellar line-up.